Back in Washington. And for anyone who is new here, don’t bother trying to break into my house because I do not live alone, I have a dog and I have ADT. My cab was already parked out front when I came downstairs at 6am. My dog did not make a fuss. Traffic was fine. My secret airport security line remained true. I nearly forgot to take my bag o’liquids out, but never mind that. Oh, and I gave the Stare of Death to a chick that tried to line jump me and she submitted to my authori-tay. I had Auntie Anne’s pretzels for breakfast and an absolutely perfect Diet Coke from the fountain. I had an exit row seat and slept for nearly the entire flight. My bag was first off the line. My Metro train was pulling up just as I got to the platform. I happen to be using the bag in which I last left my key to the DC office, which is double-cool because I really hadn’t remembered where I left it. I tried a new combination at the awesome Atrium Cafe deli and it totally worked. The rain held off until we got back to the office. I had a few good meetings and checked in at the hotel where I have perfectly serviceable wi-fi. I forgot my sunglasses, but you know. It’s always something. The Travel Gods have smiled upon me and I am grateful. All Hail, Gods of Travel. I don’t know how you knew, 24 hours ago, that I was having a rough week in Atlanta. But when I checked on my flight, (to be sure O’Hare wasn’t going paralyzed with the rest of the continent) I found a complimentary upgrade. I woke up at 6:50 this morning, knowing that I had to take the subway to the airport and not knowing whether those trains would run on schedule. So I was up, dressed, packed and out the door at 7:15 for an 11a.m. flight. The gentleman running the gate wasn’t just polite. He wore a smile. Even though he had lived through the same three-day Atlanta nightmare as the rest of the city. I suppose it is possible that he had taken a three-day nap and had missed the drama entirely, but I don’t think that was it. I fell asleep as soon as I hit my seat. Everything ran on schedule, including baggage claim. Thank you for giving me the day where everything went right. First, I am grateful that I don’t really need an alarm clock. I can count on one hand the number of times I have required the alarm to wake me up to go to work (and not to talk about gaming again, but a non-zero number of those times were due to mid-week solo sessions with Noah). But I woke up at 5:33 this morning when the alarm was set for 5:30. How long has it been broken? I haven’t the slightest idea. But someone, please remind me to buy a new one when I get home. Just in case. Second, I had dinner with RetiredBoss and his lovely wife tonight. That was the only thing that made me remotely want to get on an airplane this morning. So I walked over to Gallery Place after work to meet them at the ChopHouse. First time since last spring that it wasn’t so hot and humid that one couldn’t reasonably walk that far. We had a great meal and caught up. (Retirees love to hear the old workplace gossip and I can always use a fresh audience.) Walking back, it was all DC at Night – like the postcards. 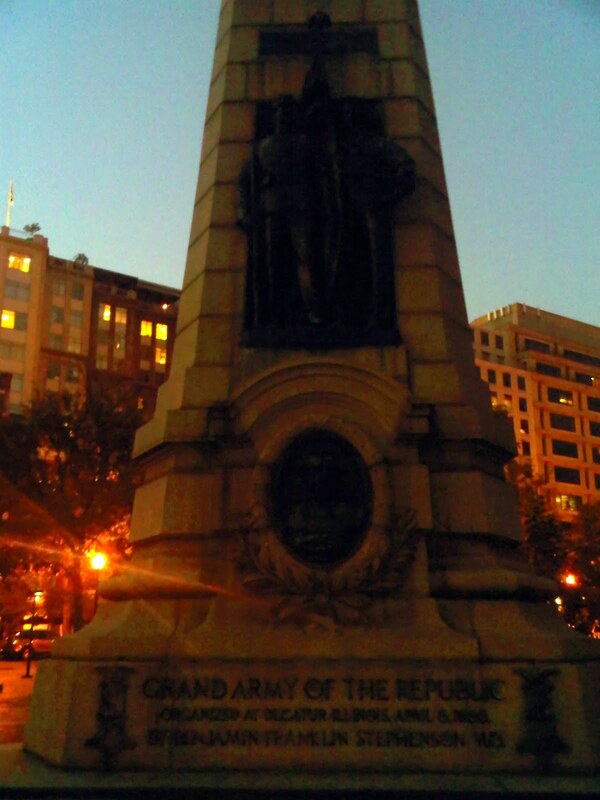 I only snapped this one little pic, in the spirit of Things I Never Really Noticed Before: a memorial for the Army of the Republic founded in 1866 in Decatur, IL. It is in Indiana Plaza. So while crossing the Mall I catch a look at the Air and Space Museum. It was closed, but the lights were on so you can see inside. You can’t really see inside during the day with the dark glass. It is pretty damn cool. Right that second, I saw a flash of light behind me. Camera flash. Tourist taking a picture of the Capitol. And I had a little moment. I do still love this city. People, I could have cried. So thanks, Dave. For driving an hour in DC traffic (two round trip) so that I could have the best night I’ve had in DC in I don’t know how long. This morning, my friend Maile was posting on Facebook about being grateful. Then, the Trib linked to this blog on Chicago Now that has the same daily theme. The author, Jennifer Fernicola Ronay, just wrote about 8 Reasons to Look Forward to Fall. I agree with every one of them. But just to be participating, I’d better find three reasons to be grateful, too. I have said before that except for those few horrible weeks in late winter, I don’t actively wish for seasons to change. I generally appreciate them all. I can be grateful for that. The bright side of the latest library delay is that now, those three weeks that I was going to miss for work-related reasons don’t matter. Grateful. It is only Sunday and I am not working again until Wednesday.